Time travel in a dream to Prewar Sanctuary, build a community there, and fight bad guys. 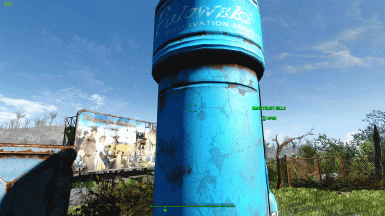 Lets you build almost continuously from Vault 111 to Red Rocket. 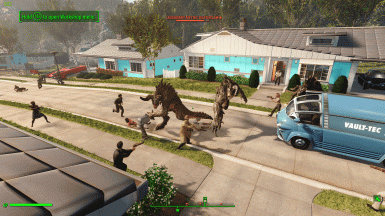 Adds several dozen residents to the pre-war world, plus craftable settlers and craftable deathclaws. Option to spawn a massive battle. - Added a more "immersive" way to access prewar Sanctuary via sleeping on the mattress in the root cellar behind the house two doors up from the player house in postwar Sanctuary. Get back to postwar Sanctuary by sleeping on the bed in the prewar Sanctuary player house. The whole experience is just a dream now. - In this dream/alternate timeline where the war never happened, added Nate, Nora, and 10-year old Shaun. - Adjusted the days in prewar Sanctuary to be much longer, since it doesn't let you wait in prewar Sanctuary and the default night lighting Bethesda used in prewar Sanctuary is horrible. So now night lasts only about 2 hours. - Made the vertibird pilot and all other officers/soldiers non-ghosts. They are flagged as protected now. 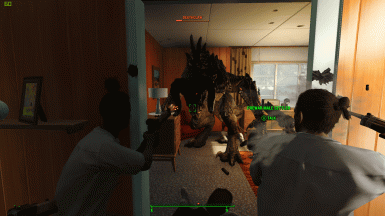 You can kill them but the Sanctuary residents can't. 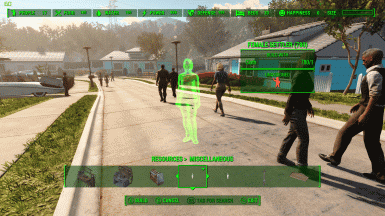 Fixed a bug where the male NPC "Joe" was showing up multiple times. Now more diversity in males. None. Shouldn't be any conflicts unless another mod comes along that adjusts the AI for Prewar Sanctuary residents. 1) Time travel to prewar Sanctuary. 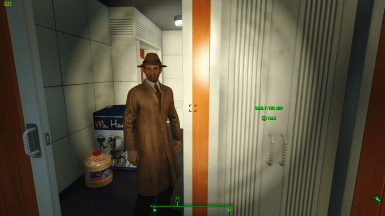 The time machine is disguised as a Pulowski Protection Shelter located at Vault 111. Stand on top of Vault 111, face northeast and you'll see it. It's the blue tubular thing. Open it. 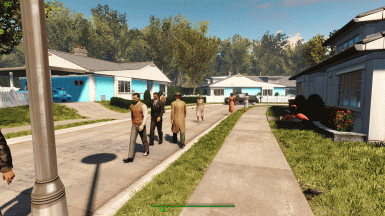 It will transport you to the pre-war backyard of the player home. 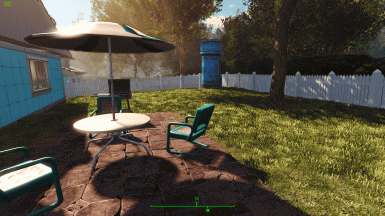 To get back to post-war Commonwealth there are three prewar time-travel locations: Red Rocket, Vault 111, and player home backyard. Blue Pulowski Protection Shelters are in each location. 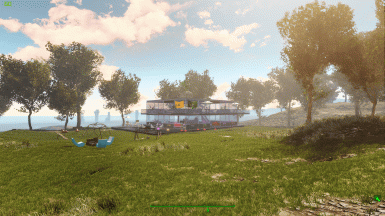 Update in V1.1: Optional "immersive" travel - In postwar Sanctuary, two houses up from the player house, there is a root cellar behind the house. Enter the root cellar. Sleep on the mattress. In your dream you are transported to an alternate timeline Sanctuary where the war never happened. You find yourself in the prewar bedroom of the player house. If you choose this travel option, you have to travel back to postwar Sanctuary by sleeping in the prewar player home bed, which transports you back to the root cellar of postwar Sanctuary. If you don't do it this way your followers will be stuck in the root cellar until you retrieve them. 2) Build almost continuously from north of Vault 111 to south of Red Rocket. 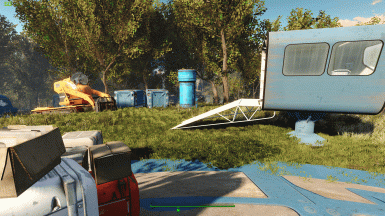 The mod adds 3 workshops (the red things) that let you do this: one at Vault 111, one in the regular Sanctuary spot, and one at Red Rocket. Note: Red Rocket is just a field pre-war. You can build on it. 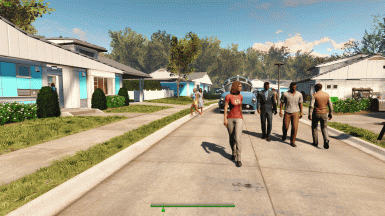 3) Assigns custom AI to prewar settlers so they walk around, talk and interact with the environment instead of just standing around. 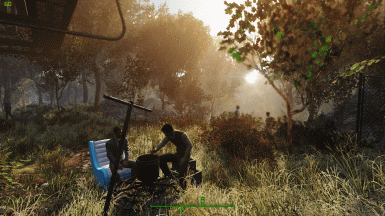 4) Adds objects to the prewar world space so the NPC's have things to interact with (campfires, seating, workbenches, etc.). 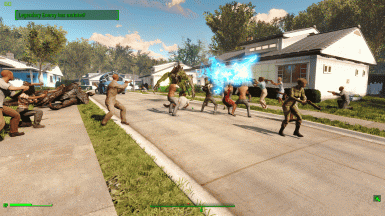 5) Adds several dozen NPC's to the prewar area between Red Rocket and Vault 111, including versions of Nate, Nora, and 10-year old Shaun. 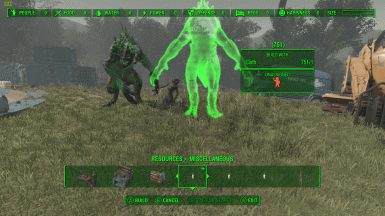 6) Craft settlers in the workshop under Miscellaneous > Resources. You can craft male settlers or female settlers. They will spawn with prewar attire. 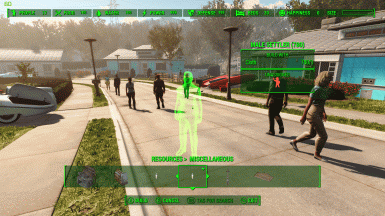 The added NPC's in this mod use the face presets from Lots More Settlers and Enemies by rbddc12 (with permission). 8) In the miscellaneous files there is the Battle of Prewar Sanctuary. This is a batch file and is optional. 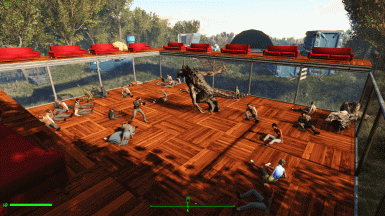 If you use it and type "Bat PrewarBattle" into the console while standing in the Sanctuary area, roughly 40 enemies will spawn across Sanctuary and Vault 111 (Deathclaws, feral ghouls, Super Mutants, gorillas, etc.). Not immersive, unless you accept that you're in a dream, but lots of fun. Try not to shoot the residents or they may turn on you. 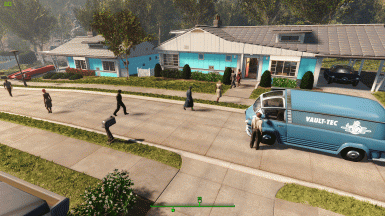 1) You may see a Vertibird hovering in the front part of Sanctuary. If the noise bugs you, just shoot it down. 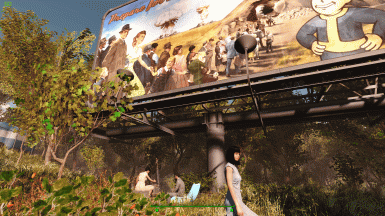 2) The Sanctuary residents may comment about Diamond City, Gray Garden, Synths, their fingernails, etc. It's because they use settler templates. 3) There aren't green borders showing you the edges of the build-able area. 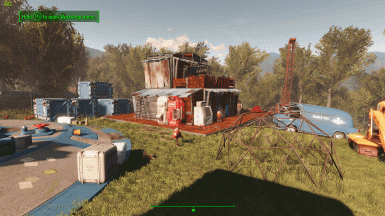 The Vault 111 workshop covers north of Vault 111 down past the creek into Sanctuary. The Sanctuary workshop covers basically the same area as the regular one, except not the Sanctuary water and bridge. 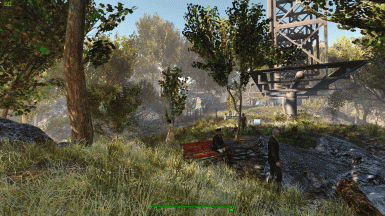 The Red Rocket workshop covers south of Red Rocket to north part way across the Sanctuary bridge. 4) You don't need GodMode to access the workshops, but the trade-off is they're limited. There's no happiness meter and the settlements won't show up on your Pipboy. You can't assign, trade with, or move the settlers. You can't recruit settlers but you can craft them. 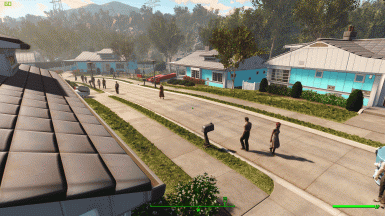 The crafted settlers are included in the settlement population count. 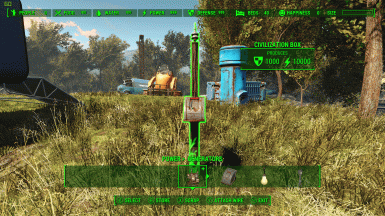 To get food, water, beds, and power stats for your settlements, you can craft a "Civilization Box" under Power > Generators. It will give the settlement 10,000 power, 30,000 power radius for wireless power, 1000 Defense, 100 Food, 100 Water, and 40 Beds. The settlers have custom AI, so they won't just stand around like unassigned settlers in the regular game. They will look busy going about their daily lives and they will interact with anything you build. 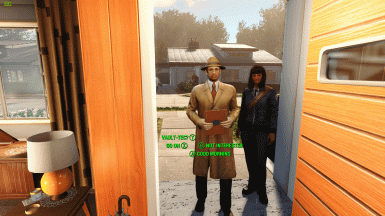 5) When starting a new game with this mod enabled, some residents are likely to stop by your house for breakfast. 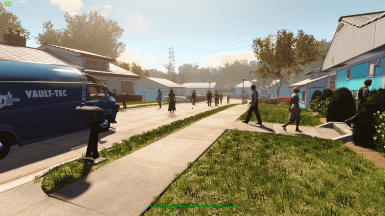 Also, some of the soldiers don't take their jobs too seriously, and some of the residents have apparently decided that instead of panicking they are going to use their last few minutes of life to take a leisurely stroll (or they didn't get the memo about the nuclear war). 6) You can't go into any existing Sanctuary houses except for the player house. Bethesda didn't build these interiors. 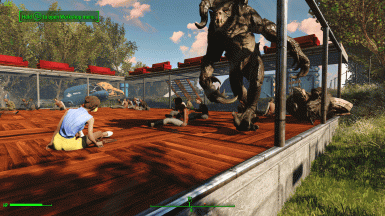 7) Some of the residents at Vault 111 and Red Rocket might not sandbox much compared to the Sanctuary residents. 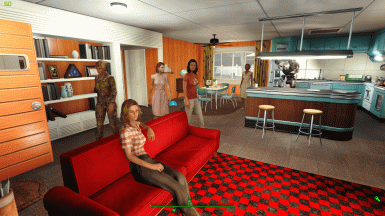 As soon as you build stuff at Vault 111 and Red Rocket the NPC's will start interacting with it. 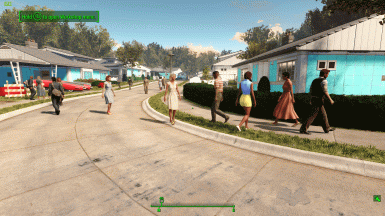 8) Bethesda didn't fully build out the prewar world. 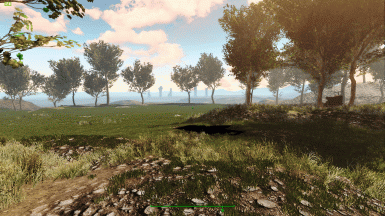 The lighting is slightly different, and if you travel south to Concord or West to Abernathy Farm you'll eventually fall off what looks like the end of the world and your game will get stuck, so save your game before trying that.